This week’s instalment of the #SBIDinspire interior design series features an insightful and gallery-esque re-imagination of interior design and visual merchandising for high-end retail spaces. Portview Fit-Out was assigned with the task of implementing the new flagship store design for Harvey Nichols in Knightsbridge. Harvey Nichols is one of the world’s leading luxury retailers, renowned for its exclusive edit of the most prestigious brands across womenswear, menswear, accessories, beauty, food and wine. In 2015, an ambitious overhaul of the iconic flagship store in London’s Knightsbridge began with the Menswear department and in 2016, the Beauty department. Portview Fit-Out transformed the interior design of the two departments to enhance the overall shopping environment for style savvy, London shoppers. The Menswear department moved away from the traditional shop-in-shop format to become a collection of specialised boutiques where rooms are treated as a gallery of installations. The Beauty lounge features 221 brands and includes a fragrance space with a selection of over 75 scents. The brief was to turn tradition on its head and, quite literally, think outside the box by moving away from the typical “shop-in-shop” format that is more commonly associated with department stores. We then applied “controlled disruption” to create a space that is effortlessly innovative and alluring. We worked closely with designers Virgile + Partners to bend the rules of modern design and deliver an awe-inspiring interior that is the absolute expression of contemporary luxury. From creating a collection of specialised boutiques in the two-storey Menswear department; where rooms are treated as a gallery of eclectic art installations, to the new open floor design in the Beauty Lounge; which nurtures ease and creativity in equal measure, we delivered an exceptional interior that has redefined the shopping experience. A project of this size and scale is always met with challenges. In this case, two existing load-bearing walls measuring 600 millimetres wide needed to be removed using a jacking system to open the space up and create a sense of fluidity. This required installing a large steel frame to support the five storeys above, which proved to be a challenge due to the phased renovation of each section giving us very limited space to manoeuvre in. As always, we rose to the challenge to enable the successful completion of the interior design of this ambitious project on time. For the menswear department, we loved applying the design principles of ‘controlled disruption’ to juxtapose traditional, luxury fabrics with more architectural, textured materials. This includes 5,200 egg cups, pebble dash, stained plywood in sculpted 3D patterns, brick slips, and slate roofing tiles, to create a sense of movement and add visual weight. Working with unconventional materials was a great experience and the completed look is exceptional. 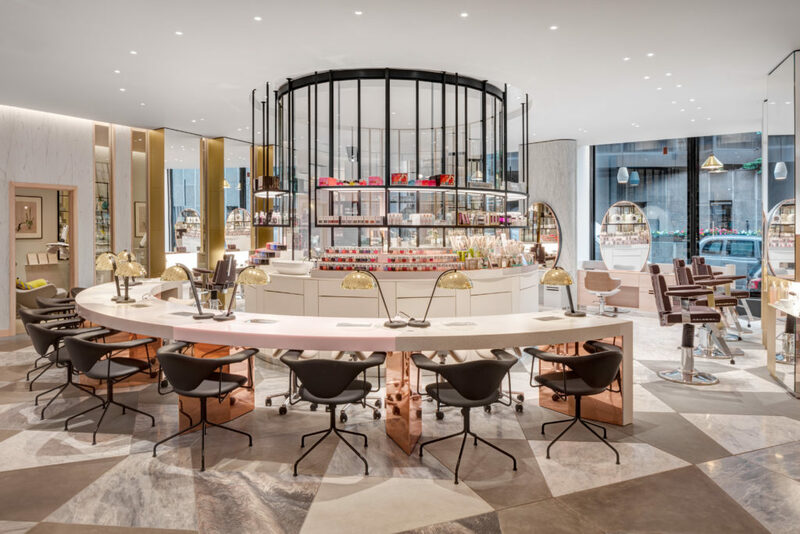 We know that the design and fit-out of Harvey Nichols’ Menswear and Beauty Lounge departments in Knightsbridge is world class and it deserves to be recognised on a global scale. Projects that are shortlisted for the SBID International Design Awards are the best in the industry and often set the precedent for future design trends to follow. The new interior of Harvey Nichols, Knightsbridge, is no exception as it delivers a new hallmark in luxury department store design that has never been seen before. That’s why we entered the SBID International Design Awards and are delighted to be shortlisted. Questions answered by Simon Campbell, Managing Director at Portview Fit-Out.